In a large bowl, cream butter, white sugar, and brown sugar until smooth. Add the eggs, yolks, and vanilla; mix until fluffy. Stir in peanut butter. Sift together the flour, baking soda, and salt; stir into the peanut butter mixture. Finally, stir in the peanuts. Refrigerate the dough for at least 2 hours. Roll dough into walnut sized balls. Place on the prepared cookie sheet and flatten slightly with a fork. Bake for 12 to 15 minutes in the preheated oven. Cookies should look dry on top. Allow to cool for a few minutes on the cookie sheet before removing to cool completely on a rack. These cookies taste great when slightly undercooked. 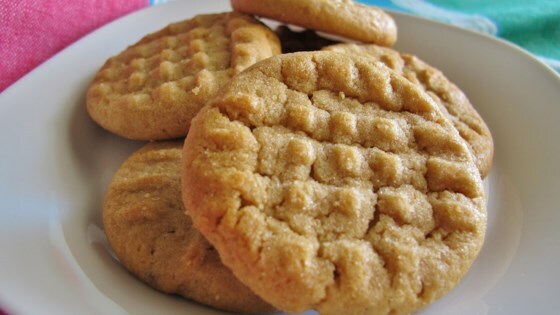 By far the best Peanut Butter cookies around! I did not use peanuts, I used chunk peanut butter and baked for 10 mins to make a little under done! WOW! The best!